Another craft book to expand your repertoire in the hobby section. With so many different things to keep you busy, and perhaps make a living from, there's no need to have just one hobby anymore. What used to be used as protection in combat, is now fashionable jewelry. You don't need a drawer full of tools either - mostly you'll need just two pairs of pliers. Not only do you have the choice of many different wires, you can also add beads to your designs for extra pizzazz. 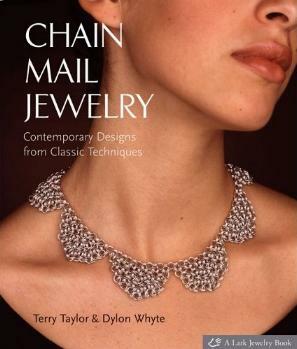 Designs featured in this book include necklaces, bracelets, anklets, and more. I liked these designs (and I'm not that creative to be able to design my own original pieces) best: Double Triangle Earrings; Gold and Amethyst Parure (I'd prefer it made in silver); Spiral Chain (gorgeous! ); Japanese Lace Collar, and the Braided Bracelet (fabulous). The great thing about having a productive hobby is that you'll always be able to give personal gifts - they mean so much. Conclusion - Very different, with much appeal.